I have been practicing veterinary rehabilitation exclusively since 2005, and in that time have witnessed how laser therapy has been of therapeutic benefit to my patients and of financial benefit to my business. In terms of the bottom line, the laser treatments have contributed in two major ways. First is the fact that when I started offering laser therapy, the unit started to pay for itself within two months. The next contribution has come in terms of marketing. While my practice encompasses much more than laser therapy, the ability to offer it has increased the awareness of our clinic in general, and in some cases has added to the quality image that we strive to project. Chief was a poor candidate for surgical repair of his CCL rupture. One of the most rewarding conditions to treat is osteoarthritis. While this condition can occur in any breed at any age, most of the patients referred to us for this condition are geriatric dogs and cats. As with many geriatric patients, there are often other medical conditions being managed, and sometimes the use of some drugs that would help relieve pain and inflammation are contraindicated or not well tolerated by the patient. Laser treatment has helped to manage debilitating pain while minimizing or eliminating the need for medications in some cases. He was treated with laser therapy and hydrotherapy. It is not uncommon for patients to show a slight improvement in mobility and in regained interest in old activities in as few as three treatments. We offer packages for our treatments to help ensure that the patient receives the cumulative effect of at least six treatments to start. 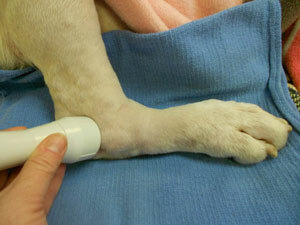 Laser therapy is then conducted on an as-needed basis, depending on the case. The treatment is not only well-tolerated, but is often anticipated in a good way. Many patients hurry into the clinic and position themselves on the therapy table while waiting for us to set up the laser. We have been able to successfully treat cats and fractious dogs that will not tolerate any other type of manual treatment in the clinic. Laser treatment and other modalities can often be performed simultaneously, which decreases the amount of time needed per patient. In terms of benefits to patients, laser therapy has increased the quality of life, and therefore the quantity, through decreasing pain, increasing mobility and speeding the rate of healing or return to function. The following case report is an example of the healing effects of the laser. The patient, Chief, is a 5-year-old American bulldog who presented to Animal Rehabilitation and Fitness Clinic Inc. in Birmingham, Ala., with the primary complaint of a torn cranial cruciate ligament in the right stifle. On examination, Chief was found to be overweight (body condition score 7/9), had a sinus arrhythmia and would sit with the affected leg in extension. When standing, Chief was toe-touch weight bearing on the right rear limb (grade 3/4), and he was non-weight bearing when walking and trotting (grade 5/5). There was a pronounced cranial drawer sign on palpation, and the tibial thrust test was positive. Chief had underlying medical conditions that made him a poor candidate for surgical repair of the ruptured CCL. His history includes a severe immune mediated disorder that resulted in vasculitis. Immunosuppressive doses of steroids could impair the healing process after surgery, and could increase the chance of infection after surgery. The steroid regime needed to keep the immune system under control also contributed to weight gain and a decrease in muscle tone. The increase in body weight and the increase in weight bearing on the left hind limb also led to the concern that a compensation injury may occur to the left hind limb. Chief also experienced calcinosis cutis. The medical management program for the cranial cruciate ligament rupture initially consisted of hydrotherapy and laser therapy in the clinic. Chief was able to ambulate comfortably for only a few minutes several times a day at home. Treatment was applied using continuous wave at the right stifle with our Companion Therapy laser. Chief often experienced pitting edema distal to both hocks, and laser treatment was applied to both using the edema program. Hydrotherapy had to be interrupted several times in the beginning of treatment due to skin lesions that would occur due to the immuno-suppression therapy Chief needed. During those times, laser treatment would be expanded to include treatment of the wounds as well. It was not uncommon to be able to start hydrotherapy again after only one or two laser treatments to the skin lesions. Chief had laser treatment twice weekly for six weeks, and improved to a grade 3/5 lameness at a walk. He was still non-weight bearing at a trot, and would sit with the right hind leg in extension. At that time the plan was to use the laser as needed to help with pain and with the distal limb edema. Hydrotherapy was continued. After two weeks the lameness became more severe. After discussion with the owner we started laser therapy again once weekly. Hydrotherapy was continued during this time. Six months later Chief is grade 2/5 lame at a walk, has increased flexion in the right stifle at a sit, has very few episodes of distal hind limb edema, has few cases of skin lesions and infections, and the left hind leg is still unharmed. Chief is now able to take short walks, and he has lost 10 of his original 95 pounds. Laser therapy has the immediate effect of reducing pain and inflammation, but there are benefits that trickle down as the dog or cat becomes more mobile. Dogs and cats that experience osteoarthritis will become less active over time. As a result, weight gain and decreased conditioning occur. These then lead into a vicious cycle of more pain and less flexibility, which can lead to more weight gain and/or decreased conditioning, etc. Laser therapy can be a powerful tool in helping to interrupt this cycle, leading to a better quality of life. Owners have been very pleased with the results. Our clients see how well-tolerated the treatment can be. They often remark that their companion is now able to follow them for periods around the house; that they show interest in jumping on furniture again (which we caution against), that they are more engaged in play, that they sleep better, etc. Dr. Grant practices at and operates Animal Rehabilitation and Fitness Clinic Inc. in Birmingham, Ala. This Education Series article was underwritten by Companion Therapy Lasers of Newark, Del.